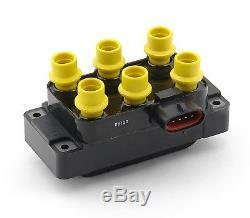 SuperCoil; 6 Tower EDIS w/Horizontal Plug; Yellow. Direct Plug In Replacement Direct OE Fit. Highly Specialized Silicone Magnetic Steel Cores. Standard Motor Products SMP Fd-488. Specialized high temperature epoxy resists shock and vibration, while increasing thermal conductivity. These are direct plug replacements for OEM coils. They feature bodies and, or secondary towers molded in ACCEL yellow and feature brass secondary contacts (except direct fire coil on plug applications). For more than 40 years, ACCEL has been a leader in performance fuel and ignition systems, proving itself on the racetracks and drag strips of the world - and on the street. With an ever-expanding line of SuperCoils and all the spark plug wires, tune-up kits, and fuel injectors hot rodders have trusted and relied on for years, ACCEL is constantly developing innovative new products designed to push power, speed, and performance to match advancements in automotive technology. Now part of Holley Performance, ACCEL offers a comprehensive selection of performance products, including coils, digital fuel injection systems, fuel injectors, distributors, caps, rotors, ignition wires, spark plugs. 4.000 X 6.700 X 4.600. The information contained in this Site, including but not limited to the rules that govern the use of the Site, is subject to change without notice. Your use of the Site following any such change constitutes your agreement to follow and be bound by the rules as changed. Permission is granted to copy electronically and to print in hard copy portions of this Web site for the sole purpose of using this Web site as an information resource (or of ordering goods or services and using this site as a shopping resource). Any other use of materials on this Web site including reproduction for purposes other than noted above, modification, distribution, or reproduction without the prior written permission of Racks for All is strictly prohibited. The Racks for All Web sites and Racks for All logo are service marks of Racks for All, a division of Kalex Enterprises, Inc.
All other trademarks, product names and company names or logos cited herein are the property of their respective owners. Racks for All reserves the right, without prior notification, to limit the order quantity on any item and/or to refuse service to any customer. Verification of information may be required prior to the acceptance of any order. Links to Other Web Sites. Racks for All makes no claim or representation, and accepts no responsibility, regarding the quality, nature, or reliability of the sites accessible by hyperlinks from this Site, or Web sites linking to this Site. Racks for All intends for the information and data contained in the Site to be accurate and reliable, however, since the information and data have been compiled from a variety of sources, it is provided AS IS. This Web site is operated by Racks for All from its offices in North Andover, Massachusetts, USA. Outdoor gear bikes, camping gear, etc. That has been used is also not returnable. Credit will be made after merchandise is received by Racks for All and found to be in new and unopened condition. This listing is currently undergoing maintenance, we apologise for any inconvenience caused. The item "ACCEL 140035 SuperCoil" is in sale since Tuesday, November 03, 2015. This item is in the category "eBay Motors\Parts & Accessories\Car & Truck Parts\Ignition Systems\Spark Plugs & Glow Plugs". The seller is "racksforall" and is located in Wilkes-Barre, Pennsylvania.